I received a copy of this book via Netgalley for the purposes of this review. After a bad investment, the Fosters find themselves looking to downsize with a small home in the country. But they can't find a property that's both affordable and large enough for the entire family, until a lawyer appears offering them the lease of a large estate called Pembrooke Park ("With two o's"), for an amount they can't refuse. Yet questions surround the property, such as: Who is leasing it to them? Why was it abandoned twenty years ago? And are the rumors of murder and hidden treasure true? I decided to read The Secret of Pembrooke Park for several reasons: one, I know a few people who love Julie Klassen's books, and I've been meaning to try them for a while. And two, it was pitched to me as inspired by Northanger Abbey. Because of that, I feel like The Secret of Pembrooke Park invites comparisons to Northanger Abbey; unfortunately it doesn't fare very favorably in that comparison. If you're looking for something fun and romantic along the lines of Northanger, you're going to be disappointed. Unfortunately, if you're looking for something along the lines of a traditional Gothic romance with Pembrooke, I feel like you're also going to be disappointed. Creepy doll house with decapitated dolls lying around. Good start, but the doll thing is quickly abandoned and forgotten about. Missing portrait of the mistress of the house. Pool of blood found on the night the family abandoned the mansion. Unknown figure in a hooded green cloak wandering about. Is it the ghost of Clive Pembrooke?! Is Clive Pembrooke the guy who owned the house before the Fosters moved in, or was that the other Pembrooke everyone keeps talking about? And why do we care about that guy? Confusing. Random journal entries mailed to Abigail for no apparent reason. A grumpy caretaker who clearly knows more than he's admitting. A lazy and suspicious manservant. A slutty sister bringing shame to the family name. It's a lot to take in. I wouldn't have minded if it was all to a purpose, but it felt more like Klassen was making it up as she went along, throwing a bunch "spooky" stuff out there in the hopes it would stick, without considering how to make the most of the strongest elements. Catherine's suspicion of General Tilney when she first arrived at Northanger Abbey was more chilling than all of the stuff in this book combined, and she made all of it up in her own head! As for the love story, I was not into it. It's kind of hard to feel invested in a relationship arc when there are three men chasing after the heroine and, as far as I can tell, they are interchangeable to her. It was impossible to tell what Abigail's feelings for the guys were, beyond "a flutter of attraction." Whenever any of them came on to her, she just kind of stood there and passively accepted what they did to her, no matter who it was. I would have liked for her to demonstrate some feeling or personal preference, by perhaps throwing herself at William, but she never did. It was very frustrating. In fact, as the book went on I grew more and more annoyed with Abigail in general. We're TOLD she's practical and knows her own mind, but her behavior doesn't really bear that out. Actually, her behavior doesn't bear much of anything out–I've encountered ghosts in literature with more personality. She's devoid of any goals or personal motivation, and feelings...? Hard to say. By the time I finished The Secret of Pembrooke Park, I found myself convinced a cup of weak tea would have been as interesting a heroine as Abigail. I will say Klassen's writing style is charming, and that was enough to keep me engaged for the first half of the book. But no writing style is enough to make me overlook the last twenty percent of The Secret of Pembrooke Park, where instead of letting the numerous plot points that went nowhere just hang there, each and every single one is laboriously explained through an endless series of expositional monologues. I'd rather be left to wonder–and that's another frustrating thing about The Secret of Pembrooke Park. There are moments when a genuine mystery or something of interest pops up (William snooping on his tour of the house, for example), but these elements are either immediately revealed as harmless (William was just curious) or dropped in favor of something else. Klassen shines when writing about everyday society–balls, going to church, Abigail's sister's behavior in London–but when it comes to building a sense of mystery, not so much. Basically, I enjoyed the first part of The Secret of Pembrooke Park, but by the end I was more than a little annoyed. If you would like to give the book a try yourself, however, there's a tour-wide giveaway! 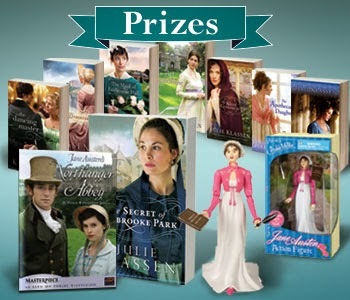 Three lucky winners will receive one trade paperback or eBook copy of The Secret of Pembrooke Park, and one grand prize winner will receive one copy of all eight of Julie’s novels: Lady of Milkweed Manor, The Apothecary's Daughter, The Silent Governess, The Girl in the Gatehouse, The Maid of Fairbourne Hall, The Tutor’s Daughter, The Dancing Master, and The Secret of Pembrooke Park, one DVD of Northanger Abbey (2007 [love this production]) and a Jane Austen Action Figure. Thanks to Laurel Ann and Bethany House for inviting me to be part of the blog tour!